You may be familiar with the popular TV show – Dragons’ Den. Well, Greg West – owner of reptile cage makers Cornels World was so keen to purchase an AXYZ CNC Router for his business, he went on the programme to pitch for investment and got it! The successful pitch was recently aired on television and can be viewed by clicking on the link below. Greg started his business back in 2000 and says it was more of a hobby at the time. The business really started to grow when he started manufacturing plastic reptile enclosures as well as utilizing other materials such as glass and wood. With the plastic caging side of the business really taking off, he decided investment was needed to enable him to purchase his own CNC router. It was his colorful pitch in ‘The Den’ with some help from his young daughter Emma that caught the attention of one of the dragons. The dragon had been so impressed he offered Greg $100,000 for 20%, despite Greg initially asking for $80,000 and so with such a generous offer, he of course accepted. However there is a twist in the story… after the show was recorded, Greg realized he was only being offered financial backing and he was looking for business help as well. So, he turned the dragons offer down and obtained a bank loan instead. 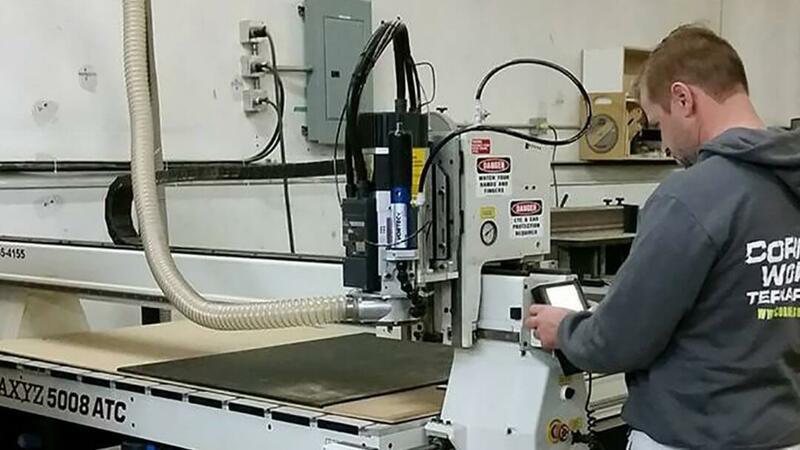 This has enabled him to purchase his first AXYZ CNC Router, a 5008 Series coupled with an auto tool changer and vacuum hold down capabilities …and he still owns 100% of his company! The AXYZ 5008 router installed at Cornels World has an effective processing area of 96” (length) x 72” (width) and like all AXYZ CNC Routers is renowned for its robust construction, high performance-to-cost ratio and utmost reliability under continuous operation. It is especially suited to handling 8 x 6 sheets, with the ability to machine materials up to 150mm thick. The router can run continuously to allow high-volume production or one-off prototypes with the same degree of quality and reliability. It can also be configured to accommodate a host of options, including the capacity for multiple heads to further accelerate the speed of production or in Greg’s case, an automatic tool change (ATC) facility chosen due to the fact most of the parts he cuts with the router require multiple custom cutting profiles and therefore cancels out the need for manual tool change-overs. The CNC Router is mainly used for machining expanded PVC sheet, but now that Greg has discovered what the machine is capable of he is also using it to cut other plastics as well as plywoods and some solid woods. To watch the Cornels World appearance on Dragon’s Den click HERE.